Yesterday's cold-core system (President's Day 2/20/12) with an elongated 500 mb low crossing Nebraska didn't produce any tornadoes, but sadly caused 1 death as straight-line thunderstorm winds farther south toppled a mobile home near Ada, Oklahoma. Shawna and I, along with photographer Stephen Locke, traversed the system driving back to KC on I-70 after the Denver Storm Chaser convention, enjoying the sight of February cumulus towers and some low-intensity storms near the wind farms west of Salina, Kansas. It's hard to get tornadoes in the Plains in February, even with cold-core systems, so our expectations were low. This system and one that produced several weak tornadoes in central Nebraska last May 12 make an interesting comparison regarding tornado potential. From the visible satellite photos above that compare both systems at early to mid afternoon, the 2/20/12 system showed little visual evidence of a closed mid-level low (too elongated and linear), and low clouds were socked in around the south-central Nebraska surface low, limiting surface heating. In contrast, the 5/12/11 system showed easy-to-see spiraled cloud patterns around both the mid-level low and surface low, with several boundaries and plentiful sunshine evident over central and southeast Nebraska providing heating and boundary focus for storms and rotation just east of the Nebraska surface low. The elongated nature of the 2/20/12 mid-level and surface lows (compare those with the more circular patterns on the 5/12/11 SPC 500 mb & surface graphics above) could not properly bring into juxtaposition the necessary ingredients and focus for supporting tornadoes (sunshine, CAPE, well-defined boundaries, and low-level shear spiraling into the Nebraska surface low). The afternoon surface analysis above also showed a strong cold front yesterday catching up with the surface dryline over northern Kansas, squeezing off needed sunshine and surface heating over that area and southern Nebraska. Meanwhile, very cold air and energy aloft surging eastward at 700 mb around the bottom of the elongated mid-level trough over southern Kansas and Oklahoma (see last SPC image above), along with sunshine and surface heating in that same area, triggered moderate to occasionally strong linear storms over southern Kansas and central Oklahoma. When considering tornado potential with cold-core systems, circular/spiraled mid-level and surface wind and pressure patterns win out just about every time when tornadoes do occur. As was announced on the ChaserCon 2012 website last month, I'll be teaching 2 tornado forecasting classes on Friday evening , Feb. 17 at ChaserCon in Denver. The first class deals with Basics (surface maps, upper air maps, and computer model forecasts, from 7:00 pm to 8:45 pm), and the 2nd class is Advanced material (including skew Ts and hodographs, from 9:00 pm to 10:45 pm). 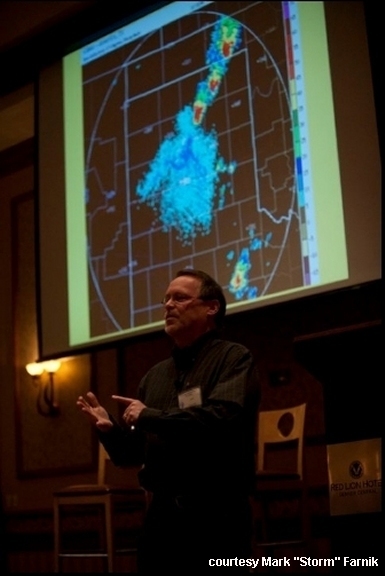 Enrollment in advance is required (you also need to be registered for ChaserCon to attend), and each class is $15.00 individually, or $25.00 for both (CASH only at the door, NO CHECKS! ).